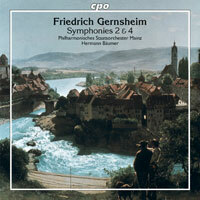 FRIEDRICH GERNSHEIM (1839-1916): Symphonies No. 2 in E Flat, Op. 46 and No. 4 in B Flat, Op. 62. Description: Our featured item in August 2001 was the two-disc, budget-priced Arte Nova 1999 release of all four Gernsheim symphonies (05D001). There are Brahmsian influences but Brahms looked back to Beethoven while Gernsheim was more of a Spohr and Schubert guy. Those of you who enjoy comparing recordings will want this new cycle (the other disc came out three years ago this month - 07P002). Symphonies One and Three were in minor keys and were full of passion, striving and heroic Romanticism but these two are the Yang of their Yin (did I really type that? ): the Second (1882) is sunny and lyrical in its outer movements and has a colorful Tarantella and peaceful Notturno in the middle while the Fourth of 1895 uses the largest orchestra of all four symphonies and while hinting at matters of large importance it ends up being a lively and cheerful farewell to the genre. Philharmonisches Staatsorchester Mainz; Hermann Bäumer.